If you are not the baby’s mom, dad or sibling, utilize universal safety measures and wear defensive equipment, if accessible. If the infant can’t cry or cough, then he or she is possibly choking. Have somebody else phone the emergency services, and move to step 3. If nobody else is accessible to phone for an emergency service, move to step 3 and attempt to aid the infant for 2 minutes before phoning the emergency service yourself. If you believe the infant is having an allergic response rather than choking, phone the paramedics instantly. If the infant abruptly stops coughing or crying and can’t appear to breathe, move to step 3. Place the infant face-down on your arm. Maintain the infants head with your hand to keep his or her neck supported. The infant’s legs should be on both sides of your arm close to your elbow. Tilt the infant down at a slant. The infant’s head must be lower than his or her waist. With the palm of your other hand, wallop the infant between the shoulder blades at least 5 times. Rotate the infant on your one arm so that they are now face up. Keep the head supported in your hand and the legs on either side of your arm. 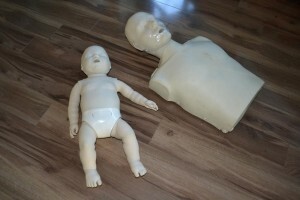 Grasp the infant at a slant and provide 5 chest compressions. Utilize two fingers and thrust down about an inch approximately 5 times. If you observe something in the infant’s mouth, draw it out. Or else, keep your fingers out of the infant’s mouth and replicate back blows and chest compressions. Keep doing it till the infant coughs up the item. If the infant becomes lifeless, start infant CPR. After 2 minutes of attempting to remove the item, call the emergency services and keep trying. When requesting somebody else to phone the emergency services, make certain you inform them why they are phoning. If the obstacle does not become apparent after three sets of back blows and chest compressions, phone for an ambulance and carry on until assistance arrives.